I always enjoy my interviews with author David Sibbet, he is engaging, informative and speaks about a subject that more people should be aware of and that is visual graphics and consulting. You might be asking why should you want to know more about this vocation or practice? Visual Consulting which is the title of David’s new book is the synthesis of helping people, either in groups or individuals solidify their dreams, thoughts, ideas and provide a mapping of that visual into something that is usable and will help them reach their aspirations and dreams–what could be better than this. It is like mind mapping, but on steroids. 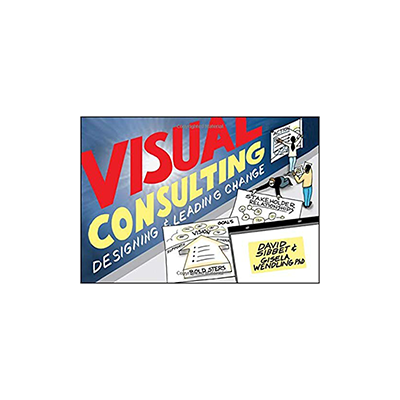 In my recent interview with David we got to explore the many aspects of Visual Consulting, and two in particular are worth a second mention. The first is the “Liminal Pathways Change Framework” and the second are the “Seven Challenges of Change”. When a graphic facilitator or visual consultant is brought into an organization usually the organization is going through change, and hopefully they are embracing the change process–but usually not. You see organization can’t change unless the people in the organization change. In the Liminal Pathways there are three phases of change: 1) Separation 2) Liminality and 3) Integration. To learn more about this process please click here to be directed to Geisla’s blog–she is David’s co-author, I know you will find it interesting and answer any questions you might have about this process. The “Seven Challenges of Change” is the second process that is addressed in “Visual Consulting” and it has seven (7) phases 1) Activating Awareness 2) Engaging Change Leaders 3) Creating and Sharing Possibilities 4) Stepping into A New Shared Vision 5) Empowering Visible Action 6) Integrating Systemic Change 7) Sustaining Long Term. If you want more on this change model just click here to be directed to David’s blog. I trust you will enjoy this engaging and informative interview with David Sibbet the author of yet another great book entitled “Visual Consulting” If you want to learn more about David and Gisela please click here to be directed to the Grove Consulting organization in San Francisco. I listened to this podcast twice as I found it fascinating and informative. Thank you Greg for a great interview.